This typical politician’s way out — I promise to respect you as I defeat you — is perhaps the best we can hope for on most matters. Say, on global warming we disagree, but we can decide to respect the good faith of the guys who think the cars and light bulbs are burning up the world. It may sound idiotic, it may lead to a destruction of our economy, it may upend civilization as we know it, but what the hey, we can be civilized about this. There must be some nicer way of telling someone you think he is an idiot. But how can we be expected to apply this to abortion? Let’s Vote: Do Americans Want To Continue Abortion or Not? 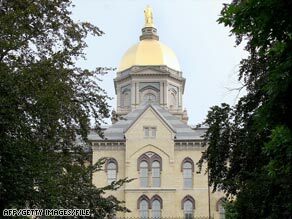 Some of you will have seen that Saint Barack ran into the first serious public hostility of his career on a visit to Notre Dame University, an old-established Roman Catholic college of some reputation, in South Bend, Indiana. The headline on this posting refers to the shouts which echoed across the hall as he addressed the student body and picked up an honorary degree, against the opposition of many American Roman Catholics. They are right to oppose these unjustified and mistaken compliments. I do not think Mr Obama seeks genuine compromise with this great Christian institution. I think on the contrary that he hopes to co-opt it into his machine, and compromise it so that it moderates its opposition to him. I also do not think that ‘Yes, we can’ is much of a response to the accusations of abortion opponents. It reminds me of the general empty-headed rock-star worship which became such a feature of Mr Obama’s campaign. What, in this instance, does it mean? So far as I know Mr Obama’s attitude towards abortion is at the extreme end of permissive, as he will no doubt show when he picks his candidates for the Supreme Court, the USA’s potent and unelected third legislative chamber. Seldom does dawn rise on an America where the morning’s New York Times displays a more intuitive grasp of a story than the New York Post. The coverage of Barack Obama’s commencement address at Notre Dame, however, was such a day. Where the Post headlined an inside spread with “Obama In the Lions’ Den,” the Times front page was dominated by a color photograph of a beaming president, resplendent in his blue-and-gold Notre Dame academic gown, reaching out to graduates eager to shake his hand or just touch his robe. We cannot blame the president for this one. During his campaign for president, Mr. Obama spoke honestly about the aggressive pro-choice agenda he intended to pursue — as he assured Planned Parenthood, he was “about playing offense,” not defense — and his actions have been consistent with that pledge. If only our nation’s premier Catholic university were as forthright in advancing its principles as Mr. Obama has been for his. President Obama’s speech at Notre Dame yesterday is another sign that pro-lifers are slowly winning the political battles over abortion. It was not the speech of a man who is confident that his position is right and popular. It was the speech of someone who is trying to minimize a problem–which is what the association with abortion assuredly is for the Democratic party. More voters have left the Democrats over abortion than have joined it. And the public has been moving in a pro-life direction for years. (The latest Gallup poll even has a majority of Americans calling themselves pro-life.) Obama wants to defend a status quo in which abortion is effectively legal through all stages of pregnancy and abortion policy is sealed off from democratic decision-making. He even wants to make taxpayers pay for abortion. So at Notre Dame, he handled the political difficulty deftly. He didn’t try to make the case for his views on abortion and related issues. He just plead for mutual understanding, civility, and the search for common ground. All of those are perfectly valid goals, of course, but they are also the ones you’d expect to see emphasized by the side that’s defending a politically dangerous position. Pro-lifers often get annoyed when they see politicians with hard-line records in favor of legal and subsidized abortion talk, as Obama did, about how much he wants to reduce abortion. But that type of rhetoric, however little follow-through it generates, is itself a concession to the moral and political force of the pro-life case. The more politicians who favor unrestricted, subsidized abortion talk about what a tragedy it is, the more they undermine their own premises. If it’s such a terrible thing, why fund it? Why not allow states to try different methods of discouraging it, including restrictions? Obama has handled the politics of abortion deftly. He is doing the best he can from a position of weakness. The hard political fact for abortion advocates is that in a society where words matter, the “pro-choice” movement is in reality what might be called the “no-choice” movement. Whatever else can be said about Roe v. Wade, the idea that a “woman’s right to choose” was freely chosen by Americans — as was true of every other basic right in the nation’s history — is fundamentally false. The American people have specifically been refused an opportunity to choose abortion policy. Instead, liberal activists chose to go through the courts. One suspects this is because abortion advocates fear an electoral result that in some fashion mirrors precisely the results Gallup has discovered — a majority opposed to the tenets of abortion as outlined in the judicial fiat that is Roe v. Wade. We probably stand in the minority, believing that when it comes to a decision to kill or not kill a baby there should be no middle ground –as the president wants. “We are guaranteed “life, liberty and” etc. Without life and the protections afforded by the law to life, there can be nothing else. But Notre Dame offered and Obama accepted an honorary degree and an opportunity to speak — something Obama is eminently qualified to do. In the courtroom of the Catholic Notre Dame, students and faculty hailed their new savior as the articulate leader he is. But to us, in the minority, there is blood on the president’s hands…..And we should know by now not to judge by his words but by his actions. Put aside the question of whether a distinctly Catholic institution like Notre Dame should award an honorary degree to a man who stands against any restrictions on abortion. Put aside the notion of academic freedom, which liberals favor as an intellectual premise, but rarely practice when it comes to conservative speakers, whom you very rarely see at the lectern at any U.S. commencement ceremonies this time of year. Focus, instead, on President Obama’s remarks and whether he is serious, or can be made so, about actually reducing the number of abortions in America, which, according to the National Right to Life Committee, has reached 50 million since its legalization in 1973. Don’t put aside, however, the argument that there is only one reason to even want to reduce the number of abortions and that is that what is being killed, terminated, evacuated (choose your term) is, in fact, human life. At Notre Dame, the president gave an eloquent and well-crafted speech, full of Christian rhetoric and self-deprecating humor. He made a strong case for civility in the abortion debate, but curiously noted the advance in civil rights legislation came only after confrontation, some of which turned violent. Without that confrontation, he seemed to suggest, there might not be laws that liberated blacks and made it possible for him to become president. In recent weeks, liberal pundits have rallied to the defense of the University of Notre Dame, which plans to honor President Barack Obama with an honorary law degree on Sunday. The award has been protested by 74 Catholic bishops and more than 360,000 Catholics signing The Cardinal Newman Society‘s petition at NotreDameScandal.com. Catholic groups and publications that have fawned over Obama and other pro-choice politicians–like Catholics United, Catholic Democrats, National Catholic Reporter and the Jesuits’ America magazine–also hypocritically accuse Notre Dame’s critics of political motives. But these voices of the left are guilty of exactly what they have accused faithful Catholics of doing: abusing religion to score political points. They consistently describe the Notre Dame controversy in reference to politics, but it is not about politics. It is about a Catholic university’s betrayal of the Catholic bishops and lack of consideration for Catholic moral teaching. It is precisely about putting faith ahead of politics and secular prestige. The individuals responsible for creating this debacle are the president of Notre Dame, Father John Jenkins, and the university’s trustees–not President Obama, not Notre Dame’s critics, and certainly not the dozens of outraged bishops. Such a mandate from the bishops’ conference is rare, but it was more than justified, following numerous commencement scandals at Catholic colleges and universities for more than a decade. Since 1993 these have been documented by The Cardinal Newman Society, which seeks the renewal of Catholic identity in Catholic higher education. And there is nothing political or partisan about it. A few years ago, we raised concerns about pro-choice presidential hopeful Rudolph Giuliani at Loyola College in Baltimore; just like Notre Dame’s bishop, Cardinal William Keeler of Baltimore criticized the choice and refused to attend the commencement ceremony. When we raised the same concerns about Hillary Clinton at Marymount Manhattan College and Eliot Spitzer at Marist College, both New York institutions chose to admit that they were no longer Catholic institutions. Catholic principles don’t change with party affiliation, and all serious Catholics would be happy if abortion and other intrinsic evils were opposed by both Democrats and Republicans. Likewise, we would be thrilled if both parties–and all Catholic universities–would embrace the Church’s just war principles, social justice teachings and commitment to subsidiarity. Those seeking to politicize the Notre Dame honor have been touting a poll by the Pew Forum on Religion and Public Life that found strong support for Notre Dame’s honor to President Obama even among self-identified Catholics. However, a subsequent Rasmussen Reports poll found that Catholics oppose the honor by an overwhelming 60% to 25% margin. Understandably most people don’t want issue politics to interfere with commencement ceremonies. But, as the Rasmussen poll accurately captured, the Notre Dame honor is not about politics and is properly understood within the context of Catholic teaching and the university’s Catholic identity. It’s understandable that President Obama’s admirers want to shield him from the embarrassment of controversy. But when they impose politics on the Catholic Church, and demand that deference to President Obama take precedent over preserving the Catholic identity of Notre Dame, they only succeed in revealing their own biases. Patrick J. Reilly is president of The Cardinal Newman Society, a national organization that works to renew and strengthen Catholic identity in Catholic higher education. The Most Reverend John J. Meyers, Archbishop of Newark, said today that Notre Dame made a mistake by awarding an honorary degree to President Barack Obama. But he urged faithful catholics to use the moment as a teaching point on life, prayer and peace. In other words, it’s an unforced error by Notre Dame: not the president. Tucker Carleson joined Fox News Channel this morning and opened with a question on the minds of many. For Obama, why Notre Dame? “Why Notre Dame? It makes no sense. He could give the commencement address at any college, why Notre Dame?” Carlson asked. “Obama can be expected to address the controversy head on,” said NBC News correspondent John Harwood. For me it is a broader issue: could the leadership of Notre Dame be so dense not to realize that this was not just another president comming for commencement. This was the North Star of Abortion for advocates of baby killing and stem cell research. This has become President Obama’s commencement on abortion and the Catholic Church. Lost here are the graduates, alumni and people of faith that love Notre Dame. Moreover, Notre Dame is now a campaign stop: just as the trip to Iowa on Earth day became a campaign stop and the trip to the Caterpillar factory to tout the stimulus became a campaign stop. So our question here at Peace and Freedom is two-fold. For Notre Dame: why Obama? Why incite bad blood on graduation day? Why give the pro-abortion president or any pro-abortion man or woman the Notre Dame stage on this day? And for Obama we think we know the answer: just being at Notre Dame means he is on a mission of middle ground outreach that is like an embrace to and from the Catholic Church. Many Americans, especially non-Catholic Americans, see Notre Dame as the Catholic Church. But in fact, Notre Dame is often criticized for being too overly liberal. But for Obama, that aura of Notre Dame as the Catholic Church, is helpful. Maybe even essential in future political battles. Notre Dame is a gift that fell into the lap of a calculating Obama political team. Pro-life groups should make Obama regret his decision…. Notre Dame is being used. Inviting Obama to Notre Dame at this moment is a matter of life and death.